AT&T subscription numbers are riding the wave of new iPhone customers to an all-time high, according to the wireless provider's latest financial report. 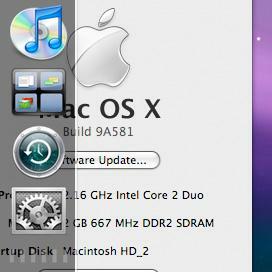 Meanwhile, the finished version of Mac OS X 10.5 Leopard makes significant changes to the Dock's behavior. And Apple has brought on a second MacBook battery supplier. Although the iPhone itself is conspicuously absent by name in AT&T's results for the September quarter, the effect of the Apple device is noticeable in the company's wireless subscriber statistics. The first complete quarter of iPhone sales was marked by a net gain of 2 million new subscribers, the statement says. This was a climb of nearly 47 percent and represents the largest growth in subscribers of any third calendar quarter in AT&T's history, the carrier says. "Churn," or the number of customers leaving the service, was also lower than in 2006 and suggests higher overall satisfaction with the company. While positive, AT&T's report does not state how many of the new customers purchased an iPhone as part of their subscription. Apple shipped 1.12 million iPhones during the three-month span and could only account for a minority of buyers as defectors from rivals such as Verizon. With new orders for Apple MacBook batteries to start shipping in December this year, plus the possibility of cutting into the supply lines of other notebook vendors, notebook battery maker Simplo Technology expects its shipment growth in 2008 to stay between 30-40 percent, according to company chairman Sung Fu-hsiang. Dynapack International Technology, who used to be the sole provider of Apple notebook batteries, commented that Apple's strong notebook sales will continue to boost market demand. Future orders are still coming strong, therefore the company does not mind seeing Simplo coming onboard as a second supplier to Apple, it noted. With the shortage of battery cells to continue in 2008, Simplo is turning to Korea-based battery cell makers for supply by providing assistance for the makers to get certified, instead of relying heavily on Japan-based makers since makers there also have their own battery module production capabilities. Therefore, notebook makers are expected to increase their adoption ratio of Korea-based battery cells in 2008, Sung added. Potentially responding to perceived criticism, MacRumors reports that Apple has tweaked the appearance of the Dock in the Gold Master build, which coincidentally began leaking to file sharing networks Tuesday evening. Where the Dock previously maintained its 3D perspective view even when moved to the left or right side of the screen —creating unusual visual effects —the final build (9A581) relies on 2D vertical strips largely similar to those in Mac OS X Tiger. The bottom alignment continues to use the new visual style. A new, 30-nanometer manufacturing process should result in 128 gigabytes of NAND flash memory in the space of a typical memory card, writes Electronista. The Korean electronics giant says that it has successfully packed more memory cells into a given unit than with current methods by merging coarse and fine patterns of cells, the combination of which lets the company produce 64-gigabit chips at the 30-nanometer density. These could combine to provide the claimed 128GB (gigabytes) of storage in a typical form factor. Commercial production of 128GB devices would not start until 2009, Samsung said. Apple has used Samsung flash memory in some iPods, most notably first- and second-generation iPod nanos, but has lately switched suppliers for its iPods while keeping Samsung onboard for the iPhone. A number of AppleInsider readers report that their Apple Store Mac OS X Leopard pre-orders switching from their initial status to "preparing for shipment," indicating that the software has finished duplication and will be in transit for many customers by mid-week. Purchasers also note that Apple has waived any expedited shipping costs paid as part of the initial order. The company still claims delivery no later than October 26th for these orders and hints that express shipping will be provided for free with at least the first batch to ensure they arrive no later than retail copies, which go on sale at 6PM this Friday. Meanwhile, the best deal on Leopard pre-orders continues come by way of Amazon.com, which does not charge sales tax and is offering an instant $20 off Leopard single license and $10 off the family pack, bringing the costs down to $109, and $189, respectively. Amazon is also offering deals on Leopard Server.